For the first time in over two decades, players of the classic World War II military strategy game Axis & Allies will be able to experience a revised edition of their favorite game. 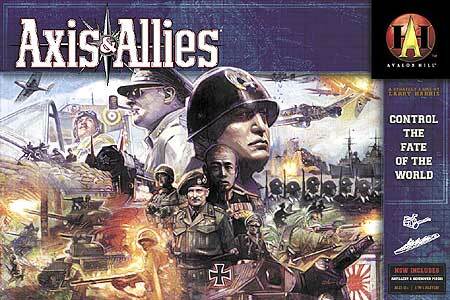 Wizards of the Coast will release a new version of Axis & Allies in March 2004. The revised Axis & Allies, created under the direction of Larry Harris, the gameâ€™s original designer, will feature more detailed game pieces, a beautifully charted, full-color world map, and updated rules that promise to make play more exciting than ever. The redesigned edition of Axis & Allies emphasizes the gameâ€™s dedication to historical detail, including the revamping of play pieces to reflect real-life military vehicles. Now German tanks are shaped like Panther tanks while the U.S. and the U.K. tanks resemble Sherman tanks. Changes to the fighter planes include transforming the U.K. fighters into Spitfires, the U.S. fighters into P-38 Lightnings, and the German fighters into Ju-87 Stukas. While retaining Axis & Alliesâ€™ historical flavor and complex strategy, updates to the gameâ€™s rules -- such as new guidelines for weapons development research -- help streamline and improve game balance. Other specific additions to the game include new sea zone configurations and even new territories. The box size has been reduced by half, making the game much easier to stock, and easier than ever to merchandise. First produced in the early 1980s by Milton Bradley, an affiliate of Wizards of the Coast, Axis & Allies is a classic game of war, economics, and strategy. Victory goes not only to the team that conquers its opponents on the field of battle but also to the individual player who seizes the most enemy territory. The game begins in spring 1942, as five world powers struggle for supremacy: Germany and Japan are aligned against England, the Soviet Union, and the USA. Players control the military and economic destiny of one of these countries in the titanic struggle that will decide the fate of the world. Axis & Allies is part of Wizards of the Coastâ€™s Avalon Hill line of games, which includes Axis & Allies Europe, Axis & Allies Pacific, Risk, Diplomacy, and many others. Other products in the "Axis & Allies" series.